How much “work” is it anyway? I’m really busy! What if it works for everyone else BUT me? What if this program doesn’t help the way it says it will? What if I don’t have what it takes to succeed? Will this investment grow my business, launch my project, or make me money anytime soon? And that’s why we’re here today: to answer these burning questions, #realtalk, #nofilterstyle. Question #1: Will DGC really work for me? Short answer: Of course it will! Long(ish) answer: If you’re a purpose-minded, growth-obsessed visionary woman who wants to be about the business of more intentionally discovering your specific (not generic) purpose, more powerfully walking out her calling spiritually and professionally (emotionally and financially), and impacting in every area of your life, then you know this is your time and you’re ready to fill in the missing pieces. EVERYTHING we teach within DGC, you’ll be able to put into play personally, professionally, emotionally, and spiritually in the real world. Meaning, I will be giving you real life-cultivation strategies I have used to organically elevate my career, powerfully grow my faith and critically increase my impact and income. But here’s the thing, I’m not going to be teaching you to do exactly what I’ve done in order to get exactly what I’ve gotten. I’ll be helping you uncover your one and only Breakout Blueprint™ so you can discover the back-to-back breakthrough that was always designed just for you to have in your unique life! We’re talking ongoing keys, principles, mindset shifts and playbooks that you can lay over every area of your life to see breakthrough in every area of your life. Seriously, where else are you going to get that? Seriously, google it! But, as with anything (in life, business, marriage, etc. ), you’ll get out of this program exactly what you put into it. So if you show up ready, expectant and willing to do the work, the results will follow. Question #2: Speaking of “work”, how much work is it anyway? I’m really busy! Believe me. I feel you! Because DGC is ongoing, meaning it’s not a time-bound, one-time course, but rather a continual resource you’ll stay plugged into, we didn’t design it to overwhelm you. We designed it to fuel you, sustain you, and replenish you over the long haul and through the variety of seasons and projects you’ll encounter in life. Much of the work you’ll do is what I call “internal work” (thinking, focusing, intentional decision making, determining, praying, meditating, observing, etc.). You’ll track your discoveries and observations and those results will become a part of your Breakout Blueprint™. So there are no random worksheets that you’ll complete and never look at again, no busy work or graded homework, and yup, this goes beyond vision boards. Much of your content will be pre-recorded video or audio or live video or audio that you can listen to on the go. All of which will be stored for you to replay on your own schedule. At anytime, you can upgrade your growth with even more content by way of additional courses, newly released reading materials and, of course, the signature DGC Finishing Retreats. This is dynamic growth at your pace, sure and steady or dynamo on the go! Question #3: What if it works for everyone else BUT me? First of all, stop worrying about everyone else. We teach you how to do that at DGC. Comparison is a major breakthrough blocker. Hear this! As soon as you join, it has worked. As soon as you feel bigger, it has worked. As soon as you start to uncover purpose and operate more powerfully in your purpose, it has worked. That’s the beauty of DGC, each of the members are on different paths, going after different things, so there’s no need to constantly measure your success against anyone else’s. Someone is launching a business or a brand, another might have just become head of a ministry, someone may want to more powerfully run her home life, you might be sitting next to a CEO looking to upgrade her impact in her company, another is looking to upgrade her faith to see more miracles break out in everyday life. Decide in advance where you want it to work and it will work. Question #4: What if this program doesn’t help the way it says it will? We only want club members in our program who want to be here, who want to grow bigger, who want to make it happen. Because of this, we offer a full 30-day refund policy so you can jump in, give it all you got, and see if it’s a good fit. We know that saying “yes” to any type of coaching and any type of new community is an investment of your time and money and an investment in yourself and your future. 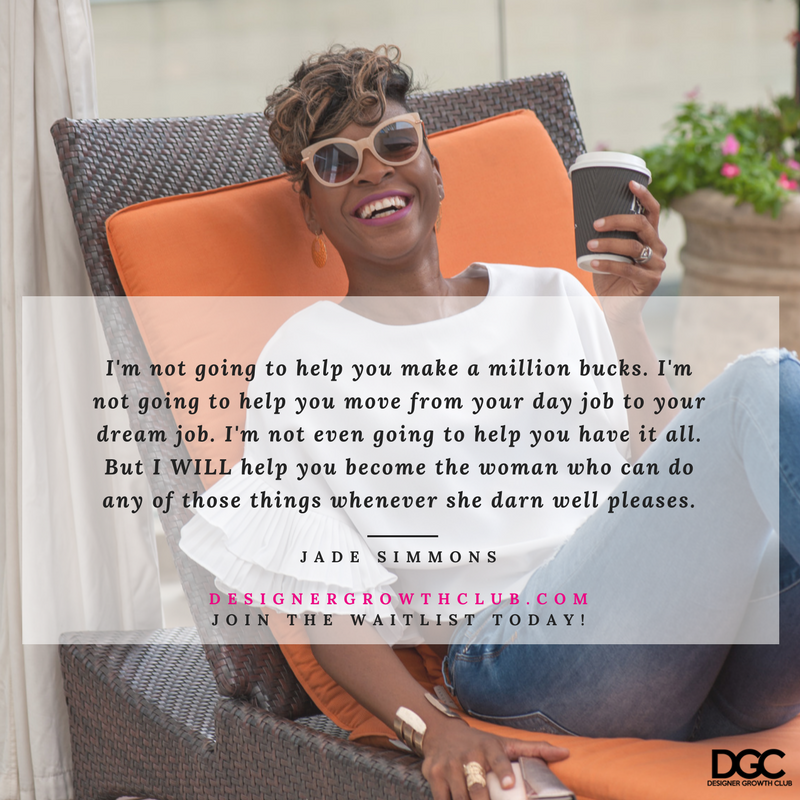 That’s why we want you to feel 100% confident that I am the mentor and guide you want in this season in your life and that the other DGC women are the community you’ve been craving. Here’s a way to play it safe: If you're concerned of spending the money, worried that it might not be what you're hoping for, or afraid you might not be able to do this for whatever reason, sign up for the quarter only, knowing you have that 30-day guarantee to get your money back. I guarantee that by the middle of Week 1, you'll say it's the best money you've ever spent. Here’s a way to play it boldly: If you have no fear, you know DGC is right for you, in fact, you’ve been waiting for it your whole life, sign up for the year. Then you can plot out your longterm course, plan your retreats and escapes and commit to building out your full Breakout Blueprint™, no interruptions. There’s the same 30-day guarantee. Question #5: What if I don’t have what it takes to succeed? What I really want to say is, “Girl, bye.” Because you and I both know you have it, you wouldn’t have read this far if you didn’t know you had it. But I’ll play along. My special gifting, my crazy 6th sense is that…I see BIG people! No really, I see people waaaaaaaaay bigger than they see themselves. So as your personal life activator and one-of-a-kind dream wing-woman, even if you come through the DGC doors somehow thinking you don’t have it, my magical power is getting you to see that you do. My literal job is to see you bigger, see your vision bigger and your possibility bigger than you and then help you bridge the gap from where you are to where all that bigness is in reality. At DGC, part of what we do is help you uncover the tools you already have and the weapons that are already in your arsenal. You’re about to be shocked at what you were born with! Question #6: Will this investment change my business, my faith, my projects, my possibilities, my community, etc. anytime soon? Yup. As early as Week 1. Remember, at DGC we’re focused on changing, revolutionizing, evolving, growing and launching YOU. So as soon as YOU change, as soon as your mindset shifts, your belief emboldens, your words morph, your modes of operation tighten, you’ll see change and growth in every corresponding area. Warning: People are going to notice. Sometimes before you do. Change is a good thing. Some of it will be tough, some of it will be complicated. Some of it will cost you. All of it will be worth it. I promise that. If you're ready to step into your next phase of existence, click here!